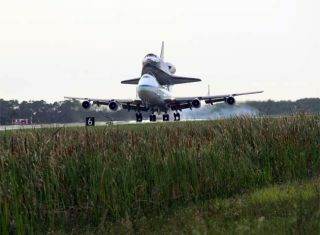 After a two-day trip from California, the wheels of the Shuttle Carrier Aircraft, or SCA, with space shuttle Atlantis secured to its back, contact runway 15 at NASA Kennedy Space Center's Shuttle Landing Facility. It took about nine minutes for shuttle Atlantis to rocketinto orbit last month for a historic final visit to the Hubble Space Telescope. On Tuesday evening, the shuttle orbiter took its time returninghome to Kennedy Space Center, treating local residents and visitors to alow-flying cruise down and back up the Space Coast before sunset atop a 747jumbo jet. "It was really amazing," said 18-year-old MaryVaruska, who ran to a Cocoa Beach balcony after hearing the jet's roar and sawcrowds of people watching. "I didn't realize how small the space shuttlelooked, in comparison to the plane." A 6:53 p.m. landing on KSC's three-mile runway capped atwo-day ferry flight that took the piggybacked aircraft from the Joshua treesof Edwards Air Force Base in California's Mojave Desert back to the palm treesof Merritt Island. Atlantis ended its 13-dayHubble servicing mission in California on May 24, after consecutive days ofrain prevented a landing in Florida. The mission "was difficult from start to finish,"said Angie Brewer, the NASA manager who oversaw Atlantis' preparation forflight, which included a seven-month delay because of a computer failure on thetelescope. But it was a success, with a crew of seven astronautscompleting all their planned upgrades and repairs to give the observatory atleast another five years of life and its mostpowerful science instruments yet. "Being part of the Hubble repair was justawesome," Brewer said. The shuttle left Edwards on Monday morning and spent thenight at Biggs Army Airfield in El Paso, Texas. From there, it made stops at military bases in San Antonio,Texas, and Columbus, Miss., on Tuesday before starting the final leg to KSCabout 4:45 p.m.
Shuttles now have returned from Edwards 53 times. Atlantis was "particularly heavy," said DonMcCormack, the ferry flight's manager. The orbiter weighed a quarter-million pounds, still carryingsome of the hardware removed from Hubble about 350 miles above Earth. Before landing, the two vehicles -- weighing about 600,000pounds combined -- roared past KSC's three-mile runway about 500 feet off theground, then made a tear-drop turn over the Atlantic Ocean and eased to atouchdown marked by streams of smoke from the 747's wheels. McCormack said requests for flybys from NASA centers -- theyalso were made at White Sands Test Facility in New Mexico and Johnson SpaceCenter in Houston -- have been on the rise. "I'm sure it has something to do with the end of theprogram approaching," he said. Eight more shuttle flights are scheduled before the fleet isretired, including two by Atlantis. After 8 p.m., the combined shuttle and 747 rolled into agantry device to be separated. Atlantis was expected to be towed back to its KSC processinghangar by this afternoon to start getting ready for its next flight, a plannedNovember trip to the International Space Station.